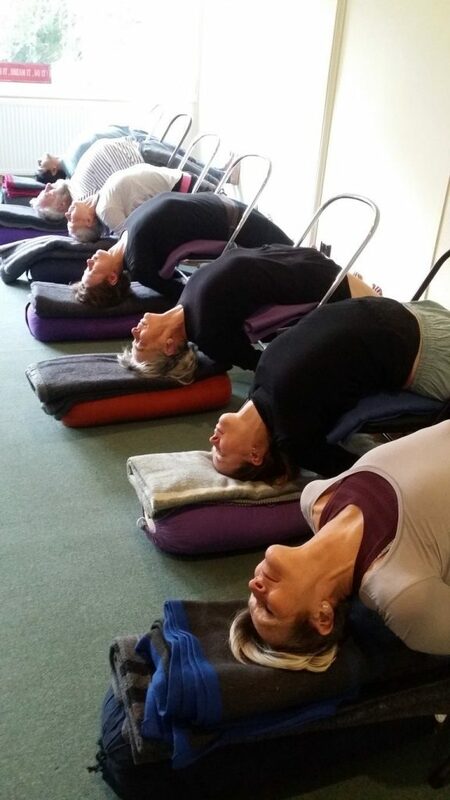 In September, I attended Ballarat Iyengar Yoga’s annual 6 day retreat with Senior Iyengar Teacher Shayna Ogden. This was a wonderful opportunity to step back from the day to day responsibilities of work and family life and become immersed in the benefits of a yoga practice under the tutelage of a wonderful teacher without the usual distractions and pressure to move on to the next task in the day. Held at Continental House in a delightful bush setting, nestled in the foothills of Hepburn Springs, accommodation is very comfortable, the old worldliness charm of the historic building and gardens providing the perfect setting for a yoga retreat and relaxing stay. There is a short walk down to the Hepburn Mineral Springs area which offers many beautiful walks and perhaps a visit to the Hepburn Springs Bath House and Pavillion Cafe. We arrived Monday morning and were immediately made to feel at home by Veronica and the group quickly found its groove as we immersed ourselves in the thrice daily practices and the routine of the week. The yoga sessions led by Shayna began in the morning at 6am with pranayama (breath control). Beginning each day this way promoting a calm and focused approach to the later asana sessions. The continuity of practising on a daily basis helping to reinforce and build on the instructions and lessons learned from the day before. Shayna shares her expert knowledge and experience with patience, respect, humility and care for each individual’s body, capacity and personal situation. Each days practice became more thorough, more mindful as the week progressed, although there were some challenges along the way. The time to include a long and restful savasana at the end of each practice brought a new level of deep relaxation to the end of each session. This way of practising opened up new insights both on and off the mat. There is time between yoga sessions for relaxing, reading, walking, massage, sleeping, chatting or just being. The newly installed Turkish bath was authentic and a surprising blissful and nurturing experience. The onsite massage equally so. Each meal was also an exquisite delight, prepared with careful attention to nutrition and presented (instagram worthy every time), with love from the wonderful chef, Alexis. Meal times provided an opportunity to come together and conversation flowed easily around the large dining room overlooking the garden providing the perfect backdrop for lingering at the table. The days seemed to go so quickly although a calm and quieter sense of doing pervaded and the week passed by equally so, it is really hard to capture the experience of a week-long retreat but I think the real benefit is how the experience somehow stays with you in the ensuing days and provides a real opportunity for growth and change. On our last night we raided the dress up cupboard, watched a yoga documentary and relaxed by the most amazing open fire in the upstairs drawing room. I couldn’t recommend a retreat with BYI highly enough. In a nutshell here are the top 6 reasons to go on a retreat with Ballarat Iyengar Yoga. (Though I could name more). Deepen your Yoga practice under the guidance of a highly qualified and expert teacher. Take time to relax, reflect and renew. Make new friends and enjoy great company with like-minded people.